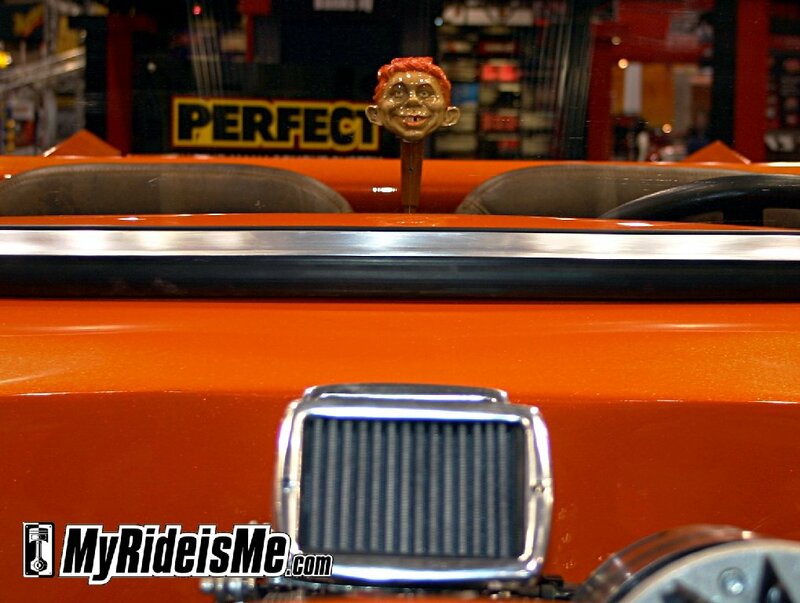 At SEMA, it’s easy to find a great car, they’re in almost every booth! But like the 70 Chevelle with a Duramax diesel motor, it’s a the different and sometimes unique builds that really get my attention. That’s what I found in this “Painless” Roadster Pickup. 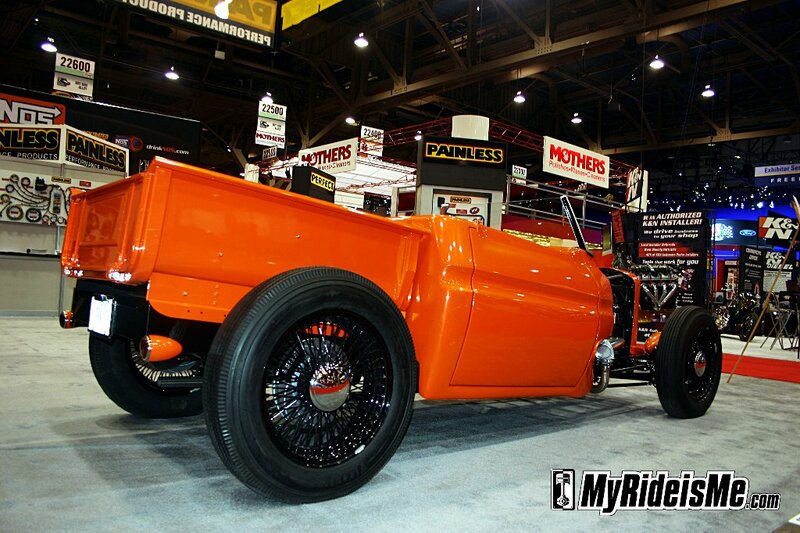 This style of roadster pickup, also called a “Truckster” was penned by well known hot rod artist Thom Taylor back in August of 2007 for Rod and Custom Magazine. The concept is simple, but you’re gonna get to know a sawzall and grinder real, REAL well to get it done. You take 50-70’s pickup, then chop up the cab and the bed until proportions of a hot rod. Easy for Thom to say! I saw a Thom Taylor sketch in the pickup bed of this truck, so I’m sure he had a hand in the proportions, color and stance that make this truck one of my favorites from SEMA. So what is it? It started as a 1978 Ford Pickup. Recognize it? From there, the cab was narrowed 16 inches, then the top and A-pillars were chopped off and the remaining cab shortened 8 inches. 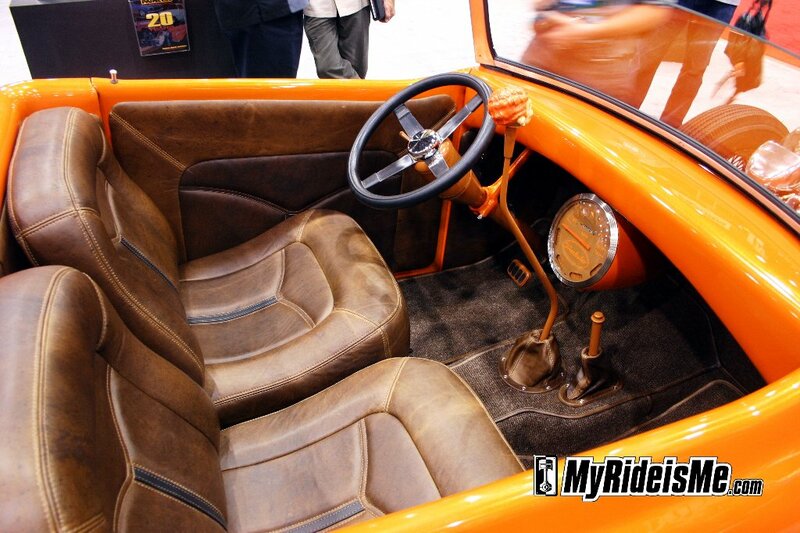 The reassembled jigsaw puzzle and newly created “roadster” body was then channeled over the frame. 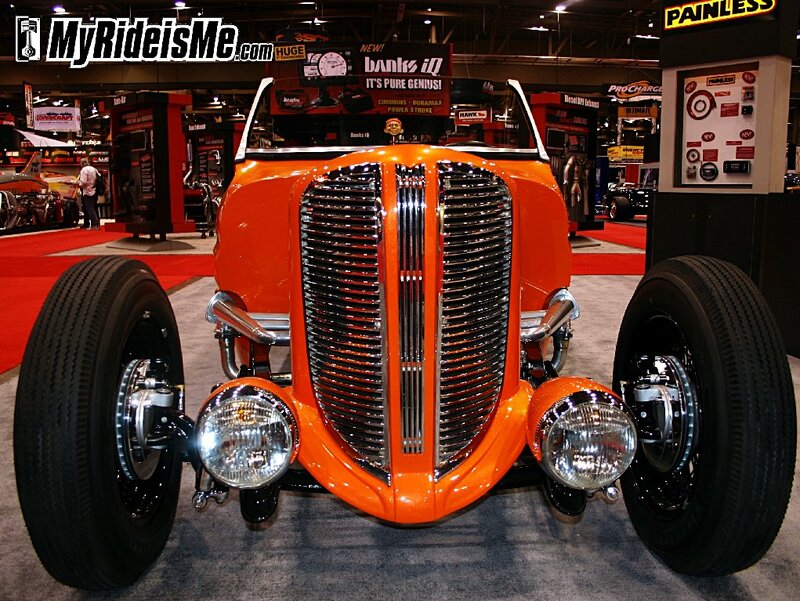 The rest of the body includes a 1938 Dodge grille and believe it or not an MGB windshield with 4 inches cut off each side. Up front you’ll find a mix of wholly (or is it Holy?) traditional 1952 Merc flathead topped by a pair of Stromberg 97 Carb-like fuel injection bodies complete with, of course, Painless Performance Products wiring. Clean, simple and brand new! 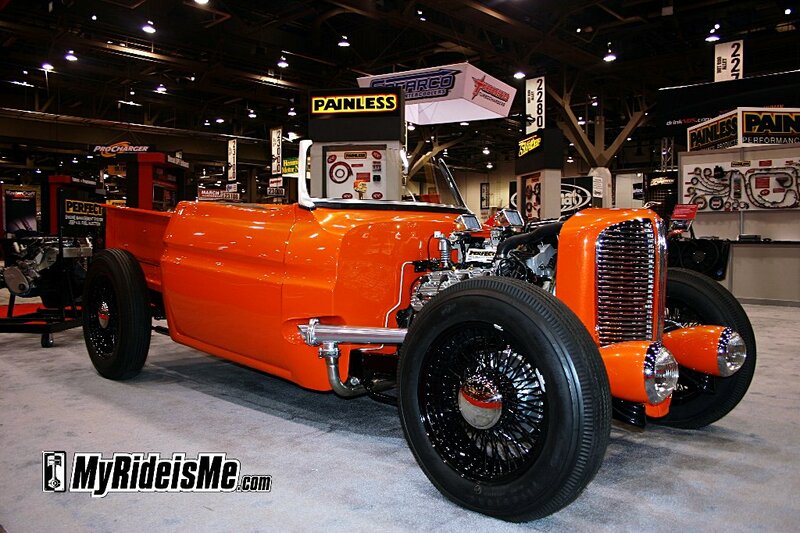 The owner and Executive VP of Painless, Dennis Overholser, told me they barely had time to tune it before SEMA. The tough stance is courtesy of 18 and 20 inch Dayton wire wheels. Straying from the traditional on the wheels like they did is a nice compliment to the fuel injection and adds to the, “What is that?” stares at the show. I guess those folks don’t read Rod and Custom? 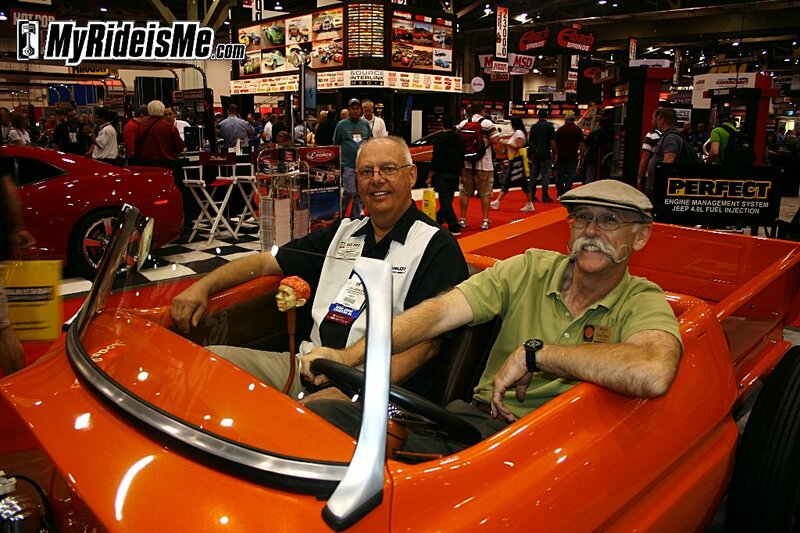 SEMA brings out just about everyone in the car world, and if you’re Chairman of SEMA’s Hot Rod Industry Alliance (HRIA) then you probably know most people, like Dennis Overholser of Painless. Follow closely because another Dennis, Dennis Gage from the show “My Classic Car” dropped by and I snapped a picture of the Dennis pair test fitting the Truckster. So there you have it, 1 Painless way to make your own roadster pickup. Will we see more? Special thanks to Optima Batteries for the trip to SEMA. Thanks for the nice article about my new ride. We will be tuning on the injection system tomorrow and try to get it ready for market. Many more new items to come. 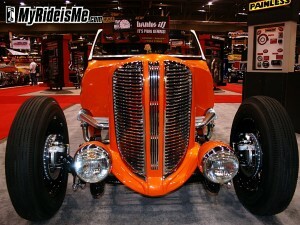 Dennis O, that is an awesome hot rod! Great idea! Tons of those 50-70’s, hey, even 80-90’s pickups ready for the roadster treatment! I love it! I’ve been wondering what it would like like if other cabs were used or if someone used a 60’s or 70s style frame. Now I know what the cab would look like. Looks great!